Driving real, measurable and successful outcomes. Our work is changing the face of neurodegenerative diseases. Giving hope to millions of sufferers that the ability to overcome these devastating diseases is in the horizon. Multiple Sclerosis (MS) is a disease that damages and destroys the myelin sheath that insulates and protects the bundles of nerve fibres or axons that carry signals between the brain, spinal cord and the rest of the body. An initial destruction of myelin leads to a secondary inflammatory cascade that alters the normal CNS landscape dramatically. This new “tissue microenvironment”, inhibits the normal remyelination capacity of the nervous syetem and leads to degeneration of the nerve fibre (axon). Crucially, rebuilding myelin provides a nurturing healthy environment for the nerve, prevents degeneration and ultimately restores function. Our work is focused on developing treatments that rebuild myelin. This means rather than just halting the progression of the disease, for the first time we may be able to actually restore neuron function in neuro-degenerative diseases like; Multiple Sclerosis, ALS, Neuromyelitis Optica, Stroke and Alzheimer’s. 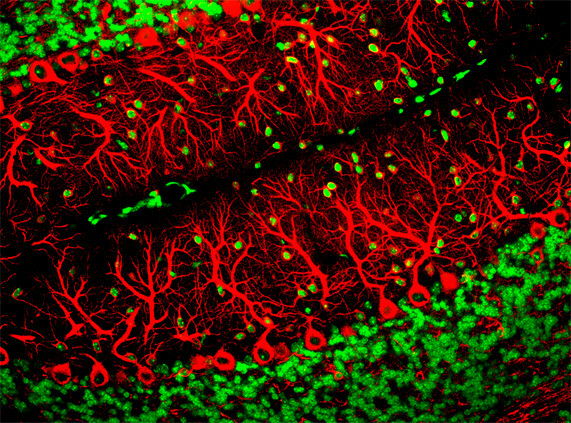 Purkinje Neurons (red). Demyelination in MS results in loss of or diminished control of movements of muscle groups needed to throw a ball, thread a needle, or drink form a glass of water. Your support means the world to us and to the millions of sufferers of neuro-degenerative diseases across the globe. Our mission is to overcome neuro-degenerative disease. While we are already undertaing groundbreaking research, we need your help to uncover new science, new biology and new treatments that will change the face of the devastating diseases which bring disability and misery to millions of unfortunate sufferers. You can help The Neurogen Foundation. Your support is key in solving this problem. Even the smallest donation will help us put an end to neuro-degenerative diseases. We thank you in advance for your support! Your donation is greatly appreciated and will be used to fund groundbreaking research into eradicating neuro-degenerative diseases.